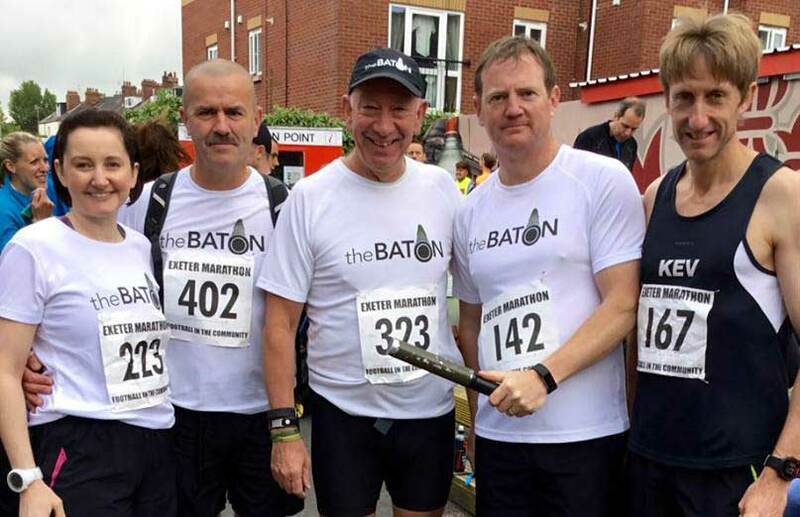 The Baton team of Baz Gray Mark White, Kevin Hawker Jenny Lane and Alan all completed the Exeter Marathon on Sunday – Congratulations to Kev for coming in 5th overall and to Jenny for completing her first marathon in under 5 hours. Baz, Mark and Alan took a steady plod chatting to people along the way about the Baton’s cause and its Message of Conscience, taking photos as they went. Great to meet Chris, Lisa Hodges Jennifer Neil and Matt and Holly Hayward – thanks for joining the Baton Family. The run also had a purpose of raising funds for the new Baton Tandem (as seen in a previous post) Baz, Mark and Alan will be running the 100k Ultra Marathon ‘Race To The Stones’ in July and Jenny, with friend Sally Bowey the Cardiff Half Marathon – any donations through the Baton’s web site would be really appreciated! Our ace runner Kev ran a ‘guess my time’ and raised £51 for us – what a star!